Work faster and more efficiently by using the AutoCAD shortcuts below. 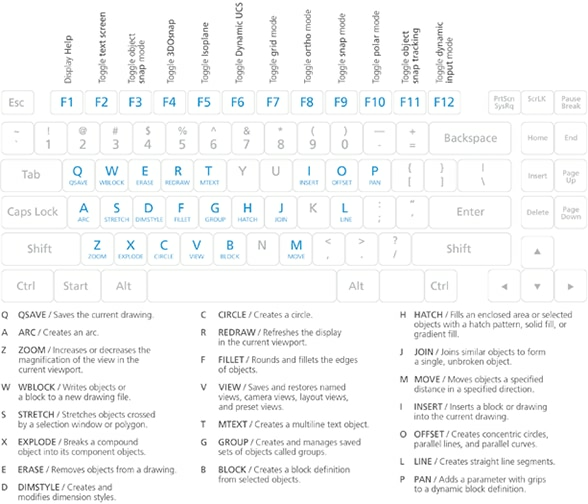 You can find a downloadable list of shortcuts and commands in the AutoCAD Keyboard Shortcuts PDF. Below, you'll find the AutoCAD one-key shortcuts. Click on the image for a larger view. Below, you'll find an abbreviated list of commands that can be used in AutoCAD. UNHIDE / UNISOLATE UNISOLATEOBJECTS / Displays objects previously hidden with the ISOLATEOBJECTS or HIDEOBJECTS command. VP DDVPOINT / Sets the 3D viewing direction. VS VSCURRENT / Sets the visual style in the current viewport. VSM VISUALSTYLES / Creates and modifies visual styles and applies a visual style to a viewport. WE WEDGE / Creates a 3D solid wedge. ZEBRA ANALYSISZEBRA / Projects stripes onto a 3D model to analyze surface continuity.